I always thought it was about time Netent released a themed slot along SuperHero lines, in keeping with their rivals. Playtech has the Marvel series themes, Nextgen have followed suit with their Justice League slot and even Yggdrasil has their aptly-named Super Heroes slot. So hows does Netent's generic fantasy superhero slot compare? Warlords Crystals of Power slot has 30 paylines, but you can opt to play just 15 if on a budget. It has the standard 5-reel 3-row format and a very decent RTP of 96.89%. For a welcome change there are no 'card' symbols like A, K, Q etc. and all symbols are pictures. The 3 prime characters are stacked on all reels and there are single non-multiplying Wilds on all reels too. The highest-paying symbols are the 3 prime characters but they only pay 10x stake, 6.66x stake and 5x stake respectively for 5-of-a-kind. The Wilds too only pay 10x stake for 5. There are 3 in-play features, all involving Wilds. As you may expect the random features are all named after the 3 superheroes! At the start of the spin, the reels will darken and slow down as the character adds their Wilds. BARBARIAN HAMMER - this will smash a 2x2 block of 4 Wilds onto the reels and can land anywhere on the first 4 reels only. PRIESTESS ARROW - awards 2-5 Wilds anywhere on reels 1 to 5. SAMURAI SWORD - awards 2-5 Wilds on reels 1 to 4 usually connected. The free games bonus on Warlords Crystals of Power Slot also has 3 different types allocated to each main character. It is about now you'd read me describing how you trigger the free games, but it's not that simple on this slot! The scatters all reside on reels 2, 3 and 4 and yes, 3 will trigger the bonus BUT this hardly ever occurs! Before you scratch your heads, there are 3 different scatters: Blue for The Barbarian, Green for the Priestess and Red for the Samurai. Should 2 land of the same colour you get a Fiery Respin and this may drop further scatter(s) of that colour in view with the original 2 held. Now if the scatters are different colours, the 2 characters will appear and do battle on the screen to decide which colour triumphs. After the battle the loser's scatter will transform into the colour of the winner. The Respin then occurs and the scatters are now on all 5 reels too! It doesn't end there! Should the respin not trigger the bonus, you have a 'Last Chance' - a hammer will smash a random position on the screen and reveal either the third scatter or more likely a reward. The reward is between 3 and 100x stake. BARBARIAN SPINS - Having got through the above, if you end with 3 or more BLUE scatters the Barbarian spins trigger. You get 3 spins for each triggering scatter, and quite often with the Respin feature you get 5 or more scatters triggering the games. These are just standard games, no multiplier or extra Wilds but you get 3 extra spins for every scatter appearing in free games. It's quite usual to get over 30 spins before the round ends. PRIESTESS SPINS - 3 or more Green scatters award a fixed 7 free spins. No retriggers but each scatter you trigger with adds 1 x multiplier to the games, so you start with a minimum of 4x. Each scatter appearing then adds a further 1x multiplier for the remaining spins. No stacked symbols in this round. 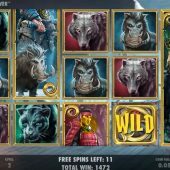 SAMURAI SPINS - 3 or more Red scatters awards 5 free games, no retiggers but every scatter landing becomes a Sticky Wild for the remaining spins. This is the hardest to trigger it seems. Warlord Crystals of Power Slot is, as you may have gathered by the complexity of the game described above, quite an involving game. Graphics are good, sound effects subtle and with the 3 in-play Wild features, the Respins on the scatters and 3 types of Free Games there are many possibilities. So why, oh why! am I opting for the latter description? The answer is simple: the terrible pay tables and lack of potential. I played this for hours and never saw a single 100x stake. Wins in the base game are seldom over 20x stake and the features rarely pay over 50x.